The names of five friend Muslim countries of Pakistan are following. The steps taken by the government for the extension of forests can be described as following. (i) The government has used uncultivated land for the extension of forests. (ii) The government has made policies for the protection of existing forests in Pakistan. (iii) The government has planted artificial forests at various places of Pakistan. (iv) The government has established a Forestry department to look after the forests in Pakistan. Five characteristics of the population of Pakistan arc following. (i) The population of Pakistan is increasing at a net rate of more than 2% per annum. It is the highest population growth rate in the world. (ii) The ratio of females in the population of Pakistan is higher than males, whereas hardly 15% of females are allowed to participate in economic activities. (iii) Infant mortality as well as under five mortality rate are very high, showing inefficiency of medical facilities. (iv) The adult literacy rate is very low, due to which healthy political atmosphere could not prevail so far. The names of Federal and Provincial Capitals of Pakistan are following. Q.6 Name any five districts of Balochistan. Five advantages of irrigation are following. (i) Due to irrigation, large scale agriculture is done and good crops are grown. (ii) A large area of arid and desert land can be brought under cultivation by means of irrigation. (iv) Irrigation is helpful for the supply of water on the natural slopes and high areas for cultivation. (v) Irrigation is helpful in the construction of canals and dams which are the sources of storage of water. The places in Punjab where Bela Forests are located are following. Q.9 Name any five trees which are found in the forests of Pakistan. The names of five trees found the forests of Pakistan are following. Q.10 Describe any five factors for the formation of soil on a particular place. Five factors which are responsible for the formation of soil on a particular place are following . Topography is an important factor for the formation of soil. Thin layer of soil rests on the slopes while it becomes thick in hollow place. Climate also plays its role in the formation of soil because wind, temperature and moisture conditions produce tleir effect on the structure of soil. Water is a factor that plays an essential role in the formation of nature of soil. Without the presence of water chemical reaction do not take place. Both plants and animals highly influence soil development. Plants maintain the fertility of soil whereas animals decompose organic matter and enhance soil fertility. Five factors which affect on the chemical activities are following. Q.12 Write down the names of five small dams of Pakistan. The names of five hydal projects of Pakistan are following. Q.14 Write any five ~a”ses of the development of Transportation system in Pakistan. The causes of the development of transportation system in Pakistan are following. (i) Means of Transportation are helpful in the expansion of market. (ii) Due to the development of the means of transport new opportunities of employment are received. (iii) The system of Means of Transportation provides help in the mobility of labour. (iv) A balanced system of the means of transportation is helpful in the transportation of goods and services throughout the country. (v) A developed system of the means of transport provides help in bringing economic growth and prosperity. Q..15 Why are energy resources important for the industries? Name any four energy resources. The importance of energy resources for industries can be described as following. .
(i). The energy resources are considered as the bacltbone of industries because they provide the needs of energy. (ii) The energy resources help in operating various kinds of machine’s related to production in industries. (iii) The energy resources help in mining, digging. and other construction process. (iv) The energy resources increase the efficiency of work and production in Industries. The names of four energy resources are following. Q.16 Write names of five pleas where sugarcane is cultivated. Five places where sugarcane cultivated are following. Cotton is a plant of temperate region but it can be grown in sub-tropical regions also. It requires high temperature at the time of cultivation 80° P to 100° P temperature remains better for its cultivation. At the time of picking 600p temperature remains sufficient. Naturally 20 inches to 40 inches annual rainfall is required for the cultivation of cotton. In Pakistan, the average annual rate of rainfall in Pakistan is 20 inches in plain areas, therefore cotton is cultivated in Pakistan through artificial means of irrigation. Excess amount of water is harmful for cotton plant. Only three to four times water irrigation per day is sufficient for the growth of cotton. In Khyber Pakhtoonkhwa, cotton is cultivated in Bannu and in Dera Ismail Khan. In Balochistan, the cultivation-of cotton is limited in the canal irrigated areas. These areas are located in the North east of Balochistan. Cotton is an important cash crop of I Pakistan. Pakistan has a permanent status among the cotton . producing countries of the world. Cotton also plays very important role in the development of the economy of Pakistan.· Cotton is known as the silver fibre, it is also called as cash fibre of Pakistan 5% of the national production is obtained from cotton. Two types of cotton is grown in Pakistan, the first is known ‘as local cotton while the other is known as American cotton. Fertile soil is necessary for the cultivation of cotton especially the soil which contains vegetative components remain suitable for the cultivation of Maize. The soil of grass lands Loamy soil and Alluvial soil and black soil are considered suitabl for the cultivation of soil. This thermal house has been established at Shardha near Lahore. It is gas turbine project which produces 85 mega watts thermal electricity. There are three thermal power houses are working at . Faisalabad. One steam power station which- produces 132 mega watt electricity while the other two are gas turbine projects which produce 215 mega watts of thermal electricity. This thermal power house has been set up at Piran Ghaib near Multan. It is steam power project and produces 265 mega watts electricity. Hyderabad Thermal Power House was established in 1971. It produces 43 mega watts of thermal electricity. M Guddu Thermal Power House This thermal house has been set up for the fulfillment of the requirement of electricity in upper Sindh. It consists of four units and total production of thermal electricity is 640 mega watts. This power house was set up in 1969. It produces 50 mega watts thermal electricity. Kotri Thermal Pose House was established at Kotri. It is gas turbine power project and produces 144 mega watts of thermal electricity . This thermal power house is located at Pasni near Makran Coast in Baluchistan. It produces 17 mega watts of thermal electricity. This, thermal power house has been established at Lakhra district in Sindh. It is coal turbine power house and generates 150 mega watts of electricity . K-Electric is the institution of generating electricity. It supplies electricity to Karachi and Lasbela. K-Electric has set up many power houses operated through natural gas and mineral oil at various places in Karachi. The total production of thermal electricity form these units is 1,138 mega watts. Q.20 Describe the geographical importance of the location of Pakistan in the Asia. Also write its administrative division. Pakistan enjoys a unique and important geographical importance and political population in the Continent Asia as well as.In.the world. The boundazies. of Pakistan are, connected to Republic China, India, Afghanistan and Iran. Pakistan has close trade relations with all neigbouring countries and these relations are further improving within time. Recently the arrangements for the trade have been established among Pakistan. Republic China and the Islamic State of Central Asia Kyrgyzstan through silk highway. The importance of the geographical location of Pakistan can be described as following. (i) Pakistan has central position in the Islamic World. All the oil producing countries of Middle East are located near Pakistan and Pakistan has good relations with all countries especially with Iran and Turkey. (ii) Pakistan is located at important sea route Karachi is an important sea port of Pakistan. Karachi sea port is a source , of commercial connections with many Asian and European countries due to its location on international sea route. (iii) Pakistan has connections through railways and roads to Iran, Turkey, Afghanistan, India, China and the countries ‘ of Central Asia which give support in trade activities. The Karakoram highway links Pakistan to China and Pakistan also building a motorway from Gawadar seaport to Peshawar which helps in the trade of the countries of Central Asia from the land routes of Pakistan. (iv) Karachi airport has also great importance, the aeroplanes of Europe and Africa pass through Pakistan when they are going to the Asian countries. (v) Pakistan has also importance according to commercial of point view. The climate of Pakistan is moderate and the water in the oceans does to freeze in any region of Pakistan, hence the trades activities in Pakistan remain continue throughout a year. In pakistan there is a Federal form of government and according to the constitution the powers are divided between the provinces and the centre. Federal government and Provincial government function according to the provisions of the constitution. The constitution of Pakistan is applicable of the following areas. (a) The province of Balochistan, the province of N.W.F.P, the province of the Punjab and the province of Sindh. (b) The Federal Administered Tribal Areas (FATA). (c) The Federal Capital area ofIslamabad. (d) and to such areas states which are included in or ever accede to Pakistan. (i) The Northern areas of Punjab in which Attock Rawalpindi, Jhelum, Chackwal are prominent here different areas like Ghore, Mayal, Dharnal, Bhangi, Sadkat, Toot, Rajpan, Dakhni, Dhudak and Adhi are the major producers of Petroleum. 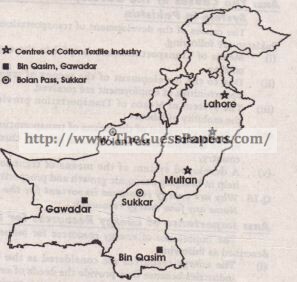 (ii) In Southern areas, the districts of Badin, Hyderabad, Sanghar are included. The places where oil and gas fields are found are Thor, Central Lashari Boby, Sonu, Pasaki, Khas Kheli, Leghari, Dhabi Mazai, Bukhari, Tajedi, Halleputa, Matali Lyari, Hari, Bhatti, Ghungro and Northern Akri are included. There is a great need of petroleum or petrol or mineral oil. It provides three times more energy than coal. Hundreds of useful components are obtained from the mineral oil in all refmeries. developed and the availability of the energy ‘goes continuously. In Pakistan better management for providing the electricity could not be made till now. Due to improper and insufficient supply of electricity and other energy resources in Pakistan, different industries have to face many problems which result in the backwardness of industries. The importance and advantages of forests can be described as following. (1) The forests are helpful in adding beauty of different regions of Pakistan. The plantation of Natural trees products natural beautiful scenes. (2) The forests help in making the temperature of the environment moderate, thus the climate becomes moderate and pleasant. Forests produce humidity in the climate, thus they are helpful in bringing rainfall. (3) Forests provide production to human beings as well as crops against windstorms and cyclones. The speed of wind storms decrease when they pass through forests. (4) Forests help in increasing the fertility of soil, the leaves of trees broken from trees and mix in the soil and thus make the soil fertile. (5) The amount of water logging and salinity is decreased slowly due to the effects of forests, thus the fertility of soil is restored. (6) The forests provide wood which is used as fuel. This wood is also used in other constructive purposes. (7) The forests provide raw material to many industries. For example he raw material for the industries of paper, match, rubber etc is obtained form forests. The trees which grow in forests are a big source of raw material. .
(8) The trees which grow near canals and rivers are helpful in making the edges strong and provide protection against floods and soil erosion .